FRAMINGHAM, Mass., October 3, 2015 – According to the latest Worldwide Semiannual Big Data and Analytics Spending Guide from International Data Corporation (IDC), worldwide revenues for big data and business analytics (BDA) will grow from $130.1 billion in 2016 to more than $203 billion in 2020. IDC's Spending Guides offer greater insight into key technology markets by providing expanded revenue detail by technology, industry, and geography. "The availability of data, a new generation of technology, and a cultural shift toward data-driven decision making continue to drive demand for big data and analytics technology and services," said Dan Vesset, group vice president, Analytics and Information Management. "This market is forecast to grow 11.3% in 2016 after revenues reached $122 billion worldwide in 2015 and is expected to continue at a compound annual growth rate (CAGR) of 11.7% through 2020." The industries driving much of this growth include banking, discrete manufacturing, process manufacturing, federal/central government, and professional services. Together, these five industries will account for nearly 50% of worldwide big data and business analytics investments in 2016 and will remain the top five industries through 2020. In addition to being the industry with the largest investment in big data and business analytics solutions (nearly $17.0 billion in 2016), banking will see the fastest spending growth. Telecommunications, utilities, insurance, and transportation will join banking as the industries with the largest CAGRs over the five-year forecast period. However, these industries will not be alone; 16 of the 18 industries covered in IDC's spending guide will experience double-digit CAGRs from 2015-2020. "This year and over the life of the forecast, we're expecting to see healthy growth in spending on big data and analytics technologies from nearly all industries, including banking and telecommunications," said Jessica Goepfert, program director, Customer Insights and Analysis. "In our end-user research, respondents from organizations in these industries are placing a high priority on BDA initiatives over other technology investments. Within banking, many of these efforts are focused on risk management, fraud prevention and compliance related activities. The customer experience is at the heart of the telecommunication industry's BDA investments; for instance, BDA technologies are being deployed in call centers to enable representatives to delight callers with superior service." Large and very large companies (those with more than 500 employees) will be the primary driver of the big data and business analytics opportunity, generating revenues of more than $154 billion in 2020. However, small and medium businesses (SMBs) will remain a significant contributor with nearly a quarter of the worldwide revenues coming from companies with fewer than 500 employees. Technology investments will be led by IT and business services, which together will account for more than half of all big data and business analytics revenue for most of the forecast period. Services-related spending will also experience the strongest growth throughout the forecast, with a five-year CAGR of 14.9%. Software investments will grow to more than $60 billion in 2020, led by purchases of End-User Query, Reporting and Analysis Tools and Data Warehouse Management Tools. Content Analytics Tools and CRM Analytic Applications will see above-average growth (CAGRs of 18.5% and 10.4% respectively) as companies expand their big data and analytic activities. Hardware investments will grow at a CAGR of 8.7%, reaching $29.9 billion in 2020. From a geographic perspective, more than half of all big data and business analytics revenues will come from the United States. 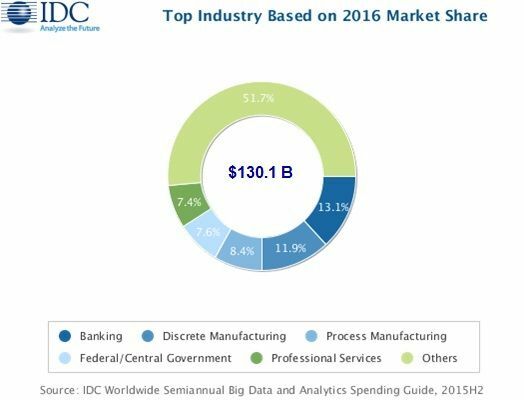 By 2020, IDC forecasts that the U.S. market for big data and business analytics solutions will reach more than $95 billion. The second largest geographic region will be Western Europe, followed by Asia/Pacific (excluding Japan) and Latin America. The two regions with the fastest growth over the five-year forecast period will be Latin America and the Middle East & Africa.